Jab saws (also known as wallboard, sheetrock or drywall saws) feature a long, narrow, serrated blade ideal for performing clean cuts of various building materials like drywall and sheet-rock (Wikipedia). The wallboard saws we examine below are all fixed blades, as opposed to folding or retractable options. You can purchase a single edged (Stanley FatMax, Wallboard Tools) or double-edged jab saw (Great Neck, Sheffield)- with the double-edged drywall saws providing more dynamic push/pull cuts (Source). The Stanley FatMax jab saw is a single-edged saw that features a 6-1/4" long blade, induction-hardened teeth, with a sharpened tip that helps perform the first drywall or cement board punch. Stanely says it's ideal for wood, drywall, durorock, & plastics- a versatile, controlled and anti-slip option that is built for longterm durability. Its thick, fatigue-resistant handle is ergonomically designed to increase comfort during extended use on job sites or for home-repair tasks. Let's take a look at 5 of the best-selling wallboard sheet-rock saws on the market today and see how they compare. 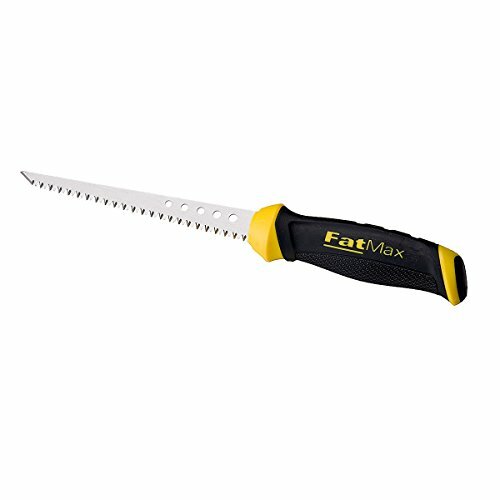 This FatMax 6-inch jab saw offered by Stanley is well-made, cheap, sharp, and it’s suitable for drywall, wood, and plastic. Users love the price and the high-quality design, but some do note that the teeth are too big. The Stanley hand jab saw measures 3” x 3” x 1”, and it features SharpTooth technology for cutting 50% faster than other saws, induction-hardened teeth that stay sharp, a 6-inch blade, and a weight of 4.8 ounces. The saw also has an ergonomically designed and slip-resistant grip, a sharpened tip for puncturing drywalls, and a limited lifetime warranty. In general, purchasers have a high opinion of the Stanley jab saw, and they agree that it’s one of the best hand saws available. A buyer comments that he saw cuts through drywalls quickly and he had no issues with its performance. He adds that the teeth are sharp and that the handle is extremely comfortable and that you don’t get tired quickly. As a professional contractor, he highly recommends it to anyone looking for the best jab saw. Another satisfied user states that after two years of use, the hand saw is still as good as new. However, some customers have complained that the quality of the jab saw is not as they expected and that it won’t last for years. Some also note that they had problems cutting through wood and that it rusted quickly. This 6-inch drywall utility saw offered by Walboard Tool is well-designed, comfortable to use, light and cheap. Users love the price and the sharpness of the blade, but some do note that they had problems with the tip. The Walboard drywall saw measures 13.2” x 3.8” x 1”, and it features a high-carbon steel blade, a chisel tip to punch wallboards, an aggressive tooth designed for smooth cutting, and a weight of 0.38 pounds. The jab saw also has a soft handle for comfort, and you can use it to cut electrical boxes, plywood, and masonite. A buyer comments that this wallboard saw leaves clean cutting edges and that it is the sharpest jab saw that he has ever encountered. He adds that the blade looks durable and that it would last for years. Another reviewer states that this is one of the fastest drywall saws and that it’s far better than similar products. He warns that you should make sure there are no wires above the area you’re cutting, or the saw would cut through them. Another customer says that the teeth are very sharp and that the handle is comfortable. He highly recommends it to anyone looking for the best drywall saw. One user complains that the tip of the blade broke quickly, but he shares that the teeth cut smoothly. If you are in need of a reliable wallboard saw, you might take a look at this double edge jab saw offered by Great Neck. Users love the comfortable handle, but some do note that it’s overpriced for them. The Great Neck jab saw measures 13.5” x 2.5” x 0.9”, and it features hardened and tempered teeth for durability, a double edge design for fast cutting, a pointed tip for punching, and a weight of 2.7 ounces. The wallboard saw also has an oversized rubber grip that reduces hand fatigue, and it’s suitable for wallboards and synthetic building materials. A customer comments that the Great Neck wallboard saw is the only one saw strong enough for jab cuts that he has encountered and that he is very satisfied with its performance and construction. Another reviewer shares that the wallboard saw is perfect for do-it-yourself projects and that you should cut gently and carefully because the blade is very sharp. He recommends it as the best double edge wallboard saw. A user also states that he likes the double edge design and that the saw cut quickly and efficiently. He adds that the jab saw doesn’t have any issues cutting through tough drywalls and that the handle fits comfortably in his hand. However, a customer complains that the blade is flimsy and that he had problems cutting through drywalls. This wallboard saw offered by Stanley is affordable, well-made, well-balanced, and an excellent choice for making cuts in plasterboards. Users love the sharp pointed tip, but some do note that the saw doesn’t come with a sheath. The Stanley hand jab saw measures 13.8” x 2” x 1”, and it features a self-starting, point-sharpened tip for plunge cuts, a 6-inch blade which is epoxy-bonded and ferruled to the wooden handle, and a weight of 3.4 ounces. This jab saw is three times more durable than other blades, and it comes with a limited lifetime warranty. In general, users agree that the Stanley wallboard saw with a wooden handle is one of the best jab saws available. A buyer comments that he was surprised how well the Stanley jab saw performed and that the tip is shaped perfectly. The reviewer adds that he had no issues cutting a hole into drywall and that the teeth are very sharp. Another customer states that the hand saw is easy to handle and that it’s also useful for carving pumpkins and gourds for Halloween. A user shares that he doesn’t use the saw very often, but it’s handy to have it around, and when he needs it, the wallboard saw works smoothly. 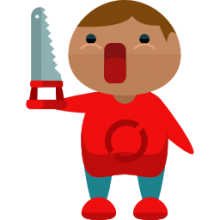 However, some customers have complained that the saw is overpriced and that they could achieve the same results with a cheaper saw. Some users also note that the construction is flimsy. If you are looking for a top-notched double edge jab saw, you might take a look at this 6-inch wallboard saw offered by Sheffield. Users love the high quality of the jab saw, but some do note that it’s not as efficient as they expected. The Sheffield wallboard saw measures 2.8” x 14.2” x 0.2”, and it features a double edge design, a 6-inch blade, a weight of 5.6 ounces, and a chamfered drive end for quick attachment. This jab saw is made of high-carbon steel and high-quality chrome vanadium steel for extra strength and durability. It’s also resistant to corrosion. A purchaser shares that he was very surprised by the quality of the Sheffield 6-inch double edge jab saw and that he doesn’t have any issues with its performance or functionality. Another reviewer adds that the wallboard saw arrived on time and that it was well packed. He states that the double edge is very convenient for cutting in both directions and that its quality surpasses its price. The customer highly recommends it to anyone looking for a cheap wallboard saw. Another buyer mentions that he used the saw to cut holes in drywall and that it cuts quickly and smoothly. However, one user has complained that the blade is too flimsy. The first jab saw we examined was the Stanley six-inch FatMax option- it features a proprietary a cutting technology called SharpTooth that Stanley says is able to cut 50% faster than traditional saws. This keyhole saw has a six-inch blade and ergonomic handle that is slip-resistant and designed for maximum comfort when cutting. Stanley says that their FatMax sheet rock saw cuts on the pull and push strokes and because the blade is tempered and hardened is designed for a durable cutting experience. Buyers say that this is not a tool that should be used on finishing work and that it doesn't ship with a protective sheath. One reviewer who is installing a home entertainment system used this jab saw to cut through drywall to configure the mounting hardware. A home contractor commended this jab saw, telling us that it is an inexpensive option of that works well for professionals as well as homeowners- though you should look at them as disposable rather than a permanent hand tool. Another contractor we spoke with as use this wallboard a saw for cutting through thick sheets of foam for custom installs of high-end computer setups. Buyers commend the strength of the keyhole saw's grip and the quality of the blade's steel, particularly the sharp point of its tip which made the first incision into the sheet-rock a lot easier. Another gardener we spoke with uses this jab saws on thick roots he encounters when spading his garden- saying it's easier to do a little push and pull sawing on the obstructive root than hack at it with the garden shovel. The second jab saw we examined was the Wallboard Tools drywall utility saw- it is advertised as a high carbon steel blade with a penetrating chisel point, 6-inch blade length, and a comfortable handle for extended push/pull sawing. One home re-modeler we spoke with commended the stainless steel build, the comfortable grip and the sharp teeth of this wallboard saw, saying that it cuts cleanly and easily. The third wall board saw we examined is manufactured by Great Neck- it is a 6 inch saw with tempered and hardened teeth and an extra large rubber grip to handle ergonomic keyhole sawing. One reviewer we interviewed told us that he had purchased many Chinese knock-off wallboard saws in the past that were just too weak, breaking whenever he tried to make a cut, but this one is strong enough to do a true jab cut. An experienced sheet rock installer says that while the saw is 6 inches long, in most cases your drywall will only be a half inch thick-so you don't need to use the full length of the wallboard saw to perform a cut. This means, that you should really go pretty gently, allowing the saw teeth to perform the work, softening up if you feel any resistance. You don't want to cut through wires that aren't shielded by conduit, so if you encounter resistance make your cut a bit shallower so you don't saw through something blindly in the background that's important. Another home repair person advised that when you begin drywall cutting, you should first turn off the circuit breakers in your home for that specific area so you don't end up electrocuting yourself. Other buyers say that traditionally they had looked for sheet rock saws at Walmart, Lowe's and Home Depot, but found that purchasing online, specifically this Great Neck model, provided them better bang for their buck. Another home re-modeler told us that their jab saw has worked efficiently in a variety of different types of walls, including plasterboard- it performs a neat cut unlike using a reciprocating saw or utility knife- the lesson being that you need the right tools for the job. The third jab saw we looked at does not have a double blade feature- it is the Stanley wood-handled, wallboard saw. Stanley advertises this saw as especially effective for plasterboard and often used to create cut outs the four types of electrical outlets- using its sharpened point for powerful plunge cuts. Stanley says that the blade itself is epoxy-bonded and ferruled to the handle for an especially durable construction. Reviewers we interviewed complimented the strength and comfort of the large wooden handle, saying that the pommel itself is also effective for tapping the blade into the wall using a small hammer or the base of your other hand. One sheet rock professional we spoke with said that overall this was a sharp and good- cutting wallboard saw that was decently priced and also useful during Halloween for carving pumpkins. The last double edged wallboard saw we examined is produced by Sheffield-it has a 6-inch blade and is built from S-2 strength steel with a chamfered drive end. Buyers we interviewed told us that there a general preference to have a double-edged drywall saws as opposed to single edged versions because it makes cutting strokes stronger. One common complaint is that these wallboard saws don't ship with sheaths or sleeves- so it might make sense to purchase that as a complementary add-on because most buyers keep these saws in the toolboxes for an extended period of time and a sheat helps keep the cutting blades protected from damage. When it comes to cutting drywall, it is actually one of the easier materials to work with when remodeling. Drywall itself is actually a combination of gypsum rock that is enclosed in wrappers oaf recycled paper. This wall sheathing is a fire-resistant supply that is pretty simple to hang and work with, even providing the means for intricate layouts. The right tools help to make working with it easy and effective.